Like a bad horror flick with predictable surprises hidden behind closed doors, we are watching an environmental tragedy unfold and we’re screaming at the top of our lungs at the screen…to no avail. Only this time, the protagonist isn’t some likeable, yet extremely naïve teenager. It’s the administrator for the Environmental Protection Agency. And what’s behind the door isn’t a chainsaw brandishing, mask-wearing lunatic. It’s 10 billion tons of toxic waste threatening the watershed for the world’s largest and most significant wild salmon run. The carnage is not immediate, but its impact would be permanent. 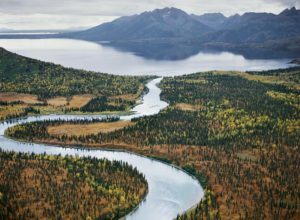 Such is the horror of the proposed Pebble Mine, resuscitated thanks to drastic and surprising reversals of environmental policy under the current administration, which seems to be wielding an axe over the Bristol Bay region of Alaska. Talk about drama. Consider that Northern Dynasty Minerals, which acquired leases to begin exploring the region for minerals (copper, gold, molybdenum, etc) in 2001, has said it was ready to begin operations only to backtrack and withdraw promises several times since. It has signed with, then alienated four different financial/mining partners. Two of the largest mining operations in the world, Anglo American and Rio Tinto, pulled out because of massive opposition from Native tribes, commercial fishermen, recreational fishermen, business owners, politicians and US citizens. Once the financial backing walked, Northern Dynasty’s stock plummeted, and proceeding was fiscally impossible without another partner. The previous administration ruled the mine would violate the Clean Water Act. With its back against the wall, Northern Dynasty filed three separate lawsuits. The initial proposal would have made the Pebble mine the largest in North America and one of the largest in the world, with a 20-square mile footprint (almost the size of Manhattan). The giant pond to hold the tailings, the toxic waste, originally was to be 10 square miles in area, up to 700 feet deep and hold up to 10 billion tons of toxic waste that could devastate critical salmon spawning areas in three major rivers. This tailings impoundment would be “held” by a dam 700 feet high (think the wall in Game of Thrones). The mine’s owners would have to continually treat the toxic waste in that impoundment area to keep it stabilized. The dam would be built over a seismically active area subject to earthquakes. Scientists question whether the proposed dam could withstand a major earthquake, like the one that struck the region in 1964. The dam and the rest of the tailings impoundment are currently scheduled to be designed by the same firm that designed the Mt. Polley Mine dam that failed in 2014, releasing more than 24 million cubic feet of toxic waste into the Fraser River estuary. The toxic waste would have to be held in the Pebble tailings impoundment in perpetuity: translation, forever. For these reasons and others, the EPA in 2014 preemptively ruled the mine as proposed would pose an imminent threat to the watershed, effectively shutting down the project. In so doing, the administration actively used the Clean Water Act to defend a vital natural resource whose value can be measured in $1.5 billion in revenue from commercial and recreational fishing and supporting 14,000 jobs. Then we had a regime change, and that haunting piano theme from the original Halloween movie started playing in the background. Now Northern Dynasty claims it has another financial backer, First Quantum Minerals, which will reportedly pay up to $150 million over four years to secure the federal permitting. The Pebble Limited Partnership filed its permit application with the U.S. Army Corps of Engineers before Christmas. The company claims it is seeking permits for a substantially smaller operation than originally proposed (down to 5.4 square miles with a smaller tailings impoundment). But opponents argue this new plan is a “wolf in sheep’s clothing,” speculating the partnership will quickly move to expand the footprint once operations start. The question isn’t whether Northern Dynasty will get those permits. That much seems obvious given recent pronouncements from the administration. The question is what happens next in Alaska. Even with the federal permits finalized, the mine’s owners would need to secure some 60 state permits. This time last year, the political winds in Alaska seemed to have shifted more toward opposing the mine. In 2014, 65% of Alaskans voted in favor of a measure that would require approval by the state legislature (rather than simply the state Department of Environmental Services) of any mine project that would threaten salmon habitat. And people in the legislature and Gov. Bill Walker have voiced strong opposition. But what are the current political winds in Alaska regarding the mine now that the administration openly favors the project? Is there enough political will to stand up to pressure from the administration? Will legislators and the governor move to protect those 14,000 jobs, which far outnumber the jobs impact of the proposed mine? Do they have the courage to stand for a crucial ecosystem that is woven into the fabric of the state’s identity? The next few months should be telling. 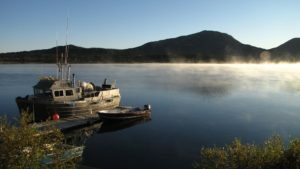 Today, opponents submitted a ballot initiative accompanied by nearly 50,000 resident signatures to the state legislature that would essentially give the state the same power to review and limit mining projects that would jeopardize wild fish populations as the EPA used under the Clean Water Act in 2014. Called Yes for Salmon, the initiative would be put on the general election ballot next November. In the meantime, skip the movie popcorn and go for the computer or phone. If protecting these resources is important to you, then silence is not an option. The EPA has been inundated with more feedback than ever because of this issue. But it’s important to show Alaska state and federal legislators and the governor that people outside of Alaska are concerned. Once that door is opened, it’s going to be damn hard to shut it again. 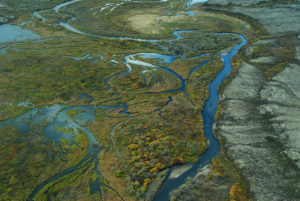 Save Bristol Bay: Good resource for the backstory on how we got here and why we should care. 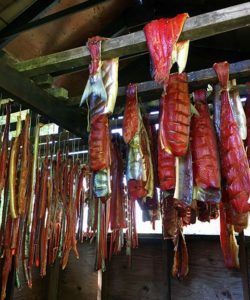 Stand for Salmon: Organization aimed at changing state laws so the legislature has more authority over permitting for operations that could endanger wild salmon populations. Businesses for Bristol Bay: Advocacy group aimed at supporting the region’s fishery and the industry that it supports. EPA website explaining why it chose to use Section 404 of Clean Water Act to protect Bristol Bay in 2016. This was before the new EPA administrator reversed that decision last spring in what appears to have been a 30-minute meeting between the administrator and the CEO of Northern Dynasty. CNN report on the EPA reversal to open the door to the mine last spring.